The Safescan 2985-SX is your ultimate tool for easy and effective counting, validating and sorting of banknotes, offering professional-grade mixed-note counting and counterfeit detection. A large touch screen with quick menu, numeric keyboard and individual presets ensures fast operation. Featuring a dual-pocket design and dual CIS technology, it will value-count even the most advanced currencies, such as those printed on polymer, those that have transparent windows and those whose denominations have nearly identical dimensions. Designed for high-volume use, the 2985-SX is ideal for businesses that need fast, error-free counting for multiple currencies and proven 100% accurate banknote authentication. The quick menu is a helpful tool that offers several features like batch presets and saving often used counting settings for dual operators, printing and a verify function. The quick menu is easily accessible via the large 3.2" TFT color touch screen. 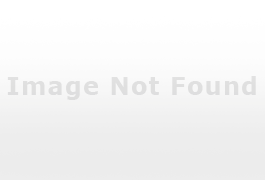 Save time and eliminate all chance of error. 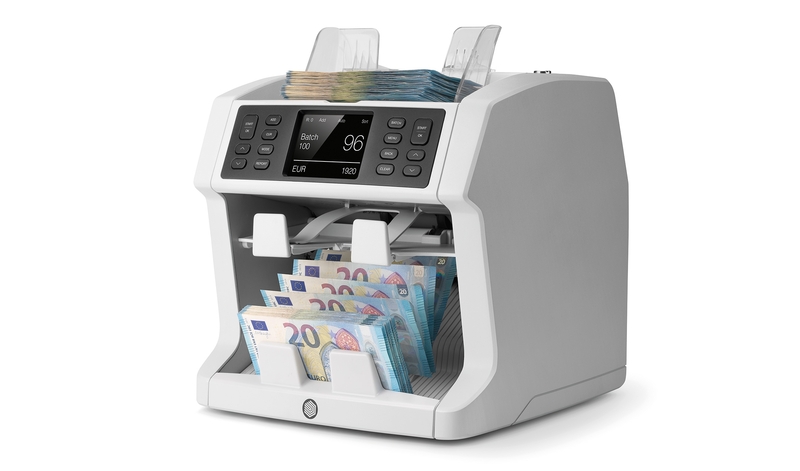 The 2985-SX’s spacious hopper can hold 500 banknotes, and with an adjustable counting speed of up to 1.200 banknotes per minute it provides you with maximum counting flexibility, reliability and efficiency. The 2985-SX’s front-loading hopper makes it possible for you to keep adding banknotes while it runs, for continuous counting—ideal in environments where time and accuracy are of the utmost importance. 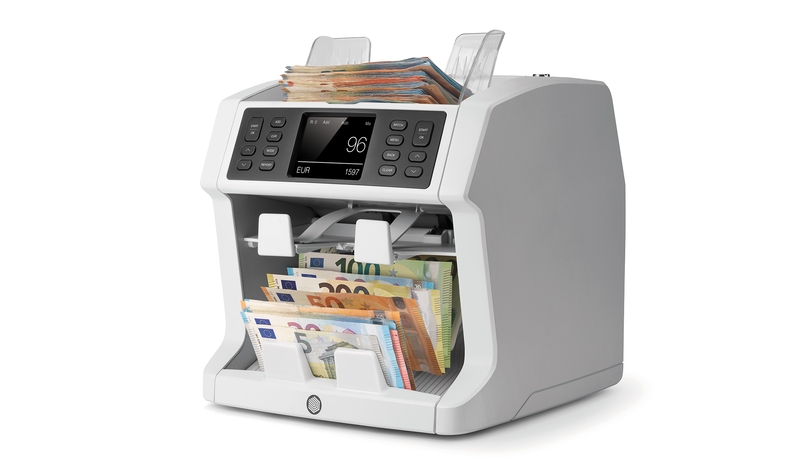 The 2985-SX is equipped with an additional stacker, known as the reject pocket, where it automatically places all unrecognized or suspicious banknotes. After counting, you can view a detailed report to see the reason why a particular banknote was rejected. The reject pocket is also used in the FACE and ORIENT modes to rapidly align a random stack of banknotes all in the same direction. The Safescan 2985-SX uses the latest counterfeit detection technology to scrutinize seven advanced security features built into today’s currencies: ultraviolet, magnetic ink, metallic thread, infrared, image, size and thickness. This technology is so reliable it will detect double banknotes and half notes. You’ll know with 100% certainty whether each banknotes is genuine or counterfeit. The 2985-SX is programmed to automatically identify and fully authenticate banknotes in all available currencies. It will count all other currencies in counting mode ALL. Save time with this convenient feature; no need to scroll through all the currencies. The 2985-SX recognizes instantly the currency of the first loaded banknote. 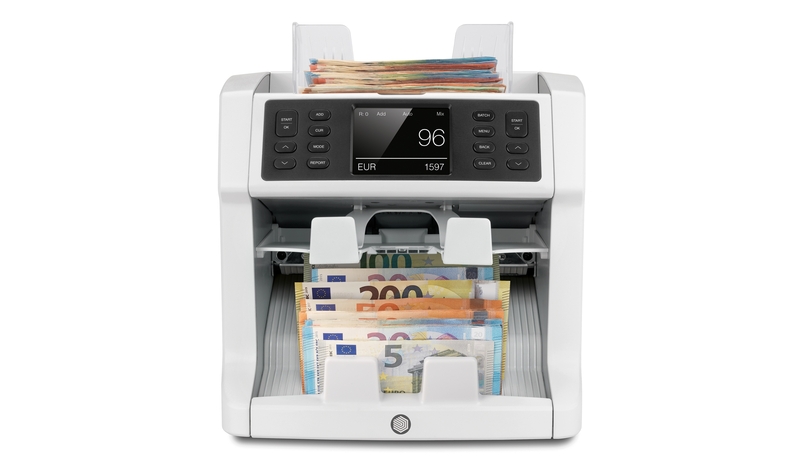 Like all Safescan money counters, the 2985-SX rapidly and reliably counts sorted banknotes in any currency, including custom coupons and vouchers. But it can also count unsorted banknotes for all supported currencies. Just place your unsorted stack on the hopper and press start; the 2985-SX will automatically keep track of the number and value counted for each denomination. What’s more: With the value-mix feature you can manually set a desired value. The machine counts banknotes until the desired value is reached. Denominations not suitable for reaching the desired value will be transported to the reject pocket. In multi-mix mode the 2985-SX will count three mixed currencies at once. All available currencies are selectable, and there's no need to sort your currencies in advance. Want your banknotes neatly organized, all facing the same way and in the same direction? The convenient FACE and ORIENT modes allow you to sort your banknotes perfectly. Thanks to its double CIS technology, the 2985-SX is able to tell which way a banknote is turned, and which side is up. It takes just two quick sorting sequences to create a perfectly sorted stack. Ideal for preparing your cash deposit or to organize your cash drawers for the next shift. 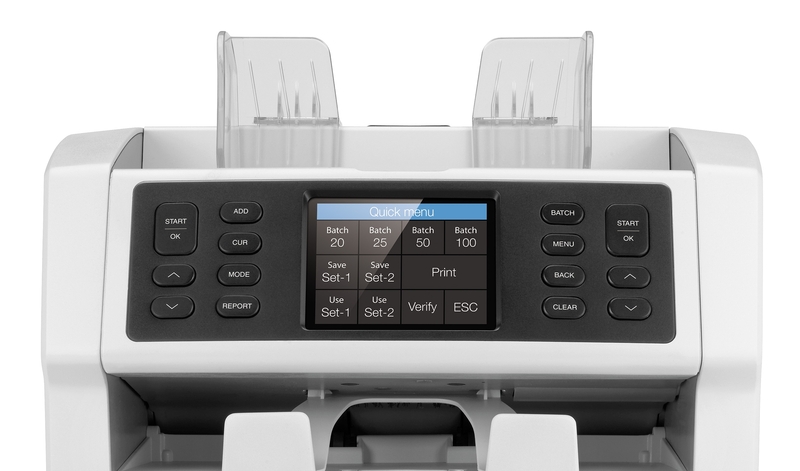 Let the 2985-SX help you optimize your cash-counting workflow. Press the convenient “add” button and the 2985-SX will automatically keep track of the total banknote count across individual runs. Press “batch” and enter the desired number of banknotes and the 2985-SX will automatically pause each time it counts out that number. There’s no faster way to prepare your bank deposits and cash drawers. Thanks to its integrated double CIS sensors, the 2985-SX is able to read the serial number on each banknote regardless in which orientation the banknotes are inserted. Serial number recording is useful for tracing and when you need an audit trail. 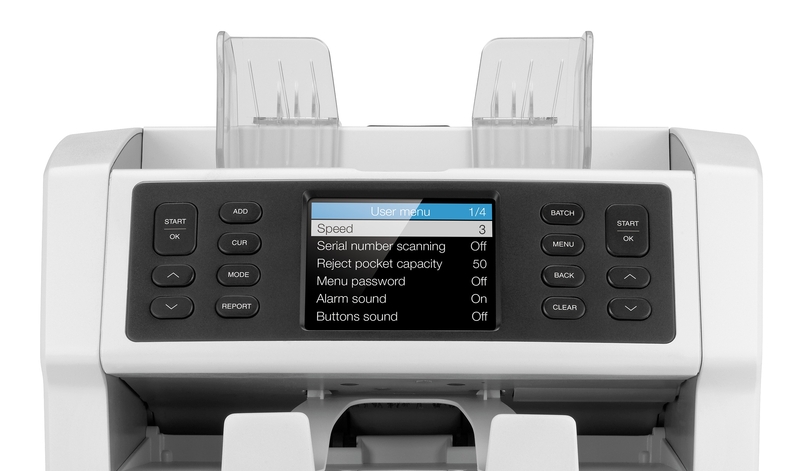 Connect the 2985-SX to the TP-230 printer and receive a detailed printout of all the scanned serial numbers. You can also export the serial numbers to the MCS software for further processing or to verify them at a later stage. To make your administrative task even easier, the 2985-SX can automatically print your complete results to the optional Safescan TP-230 thermal printer, or export them to the Safescan MCS software. MCS provides you with comprehensive, automated cash flow management and insight using advanced filters and detailed breakdowns for each employee, register and denomination. Save time and make your administrative tasks easier. The Safescan 2985-SX is packed with the latest technology that allows you to continuously and rapidly count high volumes of mixed banknotes. With the included cable you can connect your Safescan 2985-SX to the included Safescan Money Counting Software and save or export your counting results with just the push of a button. To keep your 2985-SX in shape and ensure optimal counting and verification results at all times, regular cleaning is required. The top cover and back panel of the 2985-SX can be opened in such a way that removal of any excess dust and dirt from the internal sensors and feeding mechanism can be done within seconds. No tools required to open the device!